Today begins the fateful May Day weekend for Berlin—and possible for all Germany and the world. Next Monday, May 1, is the traditional Labor Day for Europe. This morning workers are constructing stands and loudspeaker systems in two places in downtown Berlin. On the east side of the Iron Curtain that bisects the city, Communist Germans are preparing the Lustgarten at the foot of Unter den Linden for the Soviet zone demonstration. On the British side of the Brandenburg Gate, barely a mile away, West Berlin Germans are setting up their demonstration site in the Tiergarten before the ruins of the old Reichstag building. Brandenburg Gate, ostensibly in the Russian sector, carries a new red banner for the occasion. It is the dividing line. Monday morning the demonstrations will begin. Whether they will be anything more than the usual parades of trade unions and factory workers remains to be seen. The Communists announce that their May Day celebrations will be the first test of the much-publicized March on Berlin scheduled by the Communist youth on May 28. The Communist People's Police will be included in the parading. Whether they display their new weapons, their tanks and armored cars, is questionable. The West Berlin labor leaders label the Tiergarten as a demonstration for freedom and democracy and against Communism and tyranny. Whether or not there will be peace on May Day depends on many unknown factors—the weather and the discipline of the opposing two mobs expected to gather so closely together. The Communist check-off system probably will guarantee a crowd of two or three hundred thousand at the Lustgarten. But the free Tiergarten demonstration depends upon the will of the West Berliner to show up at the Western meeting to demonstrate his support of the democratic idea as opposed to Communism. In this sense, the size of the crowd at the West Berlin May Day demonstration is a test for the West. American, British, and French occupation troops are on a standby basis, and coincidentally it has just been announced that the Air Force has sent two helicopters to Berlin. The announcement says—completely straight-faced—that they are here for National Defense Day on May 20. East Berlin workmen this morning are erecting no less than thirteen red flags atop the Brandenburg Gate at the Russian sector border in downtown Berlin—while a few hundred yards away, within sight of the gate, construction workers from West Berlin are putting up a big sign on the ruined Kroll Opera House which reads "Peace in Liberty." This morning I went to the Tiergarten in the British sector and to the Lustgarten in the Russian sector of Berlin to see the final preparations for the two giant opposition May Day rallies scheduled tomorrow morning. One's first impression is that the people who make bright red bunting have been working overtime, for everywhere you look there is a flag or a banner or a sign all done in red. The main Communist slogan for this celebration is: "The first of May forever, the international fighting day of all working classes for peace, democracy, national independence, and socialism." It's a party line mouthful printed in giant letters above the speaker stand where German Communist bigwigs will review a six hour parade in the Russian sector tomorrow. The West Berlin labor leaders have issued a proclamation to all citizens, calling for a fight against "Unity in Chains" and for "Peace in Liberty." The proclamation says the Western part of the city is the symbol of the people's will for democratic liberty, and asks the population to attend the Western protest demonstrations against slavery and dictatorship. 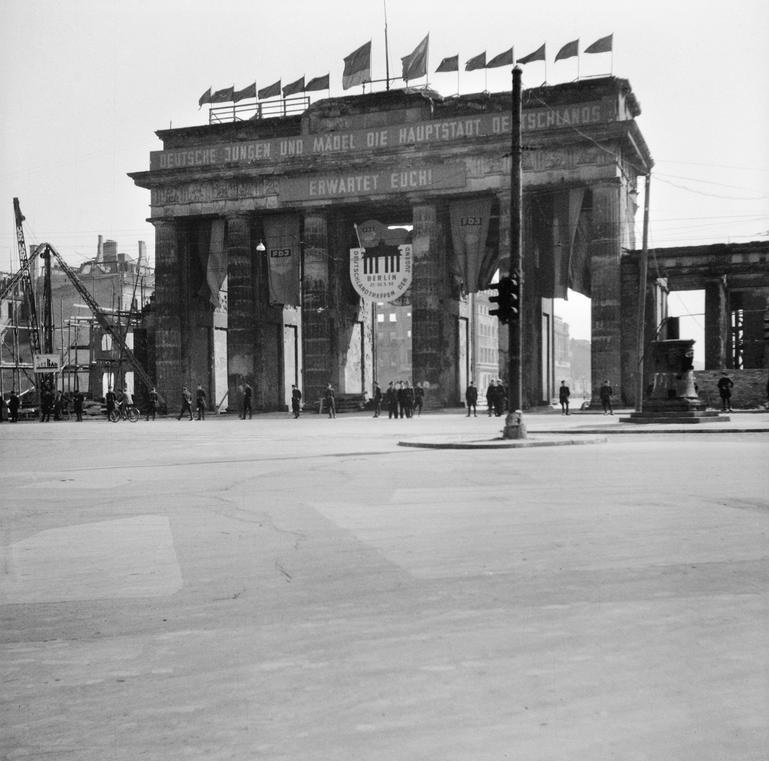 Serving as a reminder of more demonstrations to come, a statement on the Brandenburg Gate under the thirteen red flags advertises the May 28 Communist youth march on Berlin. The sign says "German boys and girls, Germany's capital awaits you." The East German People's Police, now revealed as a nucleus army being organized by Russian authorities, is beginning to show itself for May Day. This morning I counted a half dozen of these young men guarding East Berlin government buildings along the American-Soviet sector border, all armed with rifles. The contrast in the two May Day demonstrations tomorrow is revealed by their programs. The Communist-sponsored demonstration will feature drum and bugle corps of the Free German Jugend and their blue uniforms, flags, and banners. Also there will be a strong showing of crack units of the so-called People's Police, fully armed, most of whom will be dressed in black uniforms, as were Hitler's SS corps. The West Berlin rally will start off with a symphony orchestra playing Beethoven's "Fidelio" motif—then speeches by Mayor Ernst Reuter, a representative from the Bonn government, and Irving Brown, European representative of the American Federation of Labor. There also will be speeches from the Communist side. Party leader Walter Ulbricht sets the theme of these addresses this morning in an editorial in the Communist press. "The future of the German people is threatened by the Anglo-American imperialists," Ulbricht says. "They are colonizing Western Germany and are preparing it for a military base." Western authorities are confident that the West Berlin police can handle any disturbances that may break out tomorrow. But in case of an organized putsch against the American, British, and French sectors of the city, the occupation troops of these nations are standing by. West Berliners staged one of the biggest mass meetings in the history of this beleaguered city when almost a half million quiet and determined people put on a display of democratic force behind Russia's Iron Curtain. The Western demonstration was held on the British-Russian sector border in front of the ruined Reichstag and within shouting distance of the Brandenburg Gate, where more than one hundred black-uniformed Communist People's Police guarded the Russian sector of the city against any possible mobs. The Russian-sponsored demonstration in the Lustgarten at the other end of Unter den Linden drew upwards of three hundred thousand persons, and by comparison it was a better show with its military bands, its parading youth organizations, and the crack marching of the several thousand People's Police. Both East and West Berlin authorities took unprecedented precautions to handle any rioting. The Russian memorial, which stands only one hundred yards inside the British sector, was ringed by British military police with sidearms and tear gas. A special Russian guard carried Tommy guns. Riot squads and fire hoses were ready. Overhead, British reconnaissance planes patrolled the area, watching for possible invasion mobs from the East. Two American Air Force helicopters made similar reconnaissance flights over our border nearby. It has been reported that fifty thousand West Berliners stoned East German police at Potsdamer Platz this morning in the first May Day incident in this hottest spot of the Cold War. The anti-Communist demonstrators were presumably departing from a giant mass meeting a few blocks away in the Tiergarten. It was five years ago today that the remnants of Adolf Hitler's army bitterly surrendered the encircled city of Berlin to the Russian Army conquerors. In many ways, the present Cold War for Berlin is just as bitter but, thank the heavens, not so bloody. The entire city is proud this morning that it got through May Day without bloodletting, which might have occurred if the Eastern and Western police had not been under strict orders to prevent such a thing. The mob that stoned the Communist police at Potsdamer Platz was quickly dispersed. Two Eastern policemen were reported to have been slightly injured. Today both sides are claiming political victory as a result of their gigantic demonstrations, but a real showdown does not appear likely until Whitsuntide on May 28, when the Communist youth organization threatens to invade the city. 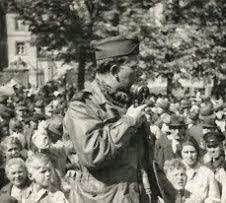 Among the things that May Day proved is that the extensive military preparations by American, British, and French occupation troops here shows we are ready to fight, and shoot, if necessary to maintain the Western position in Berlin, and that an overwhelming majority of West Berliners stand by our side and are our responsibility to keep them free. The Communists also proved that they have captured the imagination and enthusiasm of the German youth in their zone and that they have assigned the Communist youth the dangerous task of capturing democratic Berlin and Western Germany for the Soviet Union. The two young People's policemen from the Russian zone who were arrested in the American sector were sentenced today to a year in jail after conviction of being members of a paramilitary organization. Heinz Nocht and Wilhelm Roloff both testified that the People's Police is a nucleus German army being organized by the Russian authorities. Today they claimed that they were victims of a gigantic hoax, that Soviet authorities had tricked them into joining such an illegal military organization.